Living a more sustainable, eco-friendly, or vegan lifestyle may seem daunting. There’s a common misconception that living this way is more expensive. 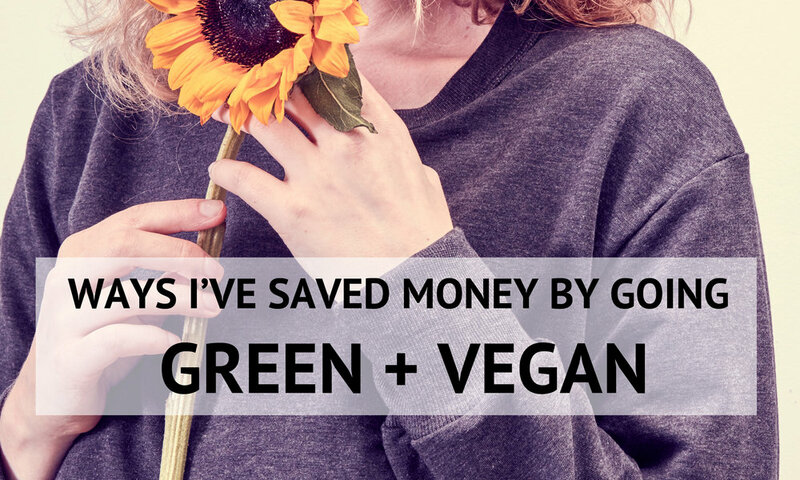 Since I’ve started living a green and vegan lifestyle, I’ve actually saved money! MAKE UP REMOVER WIPES- Instead opt for reusable bamboo or organic cotton rounds. I love pairing these with an oil based cleanser to remove make up. I toss them in the wash in a delicates bag after. FAST FASHION- Instead of heading to the mall or shopping strip every season to buy tons of inexpensive, cheaply made, and unethical clothing every season, I shop small, sustainably, and ethically with designers that I love and trust. Although slow fashion costs more per item, I found I save money not shopping as frequently. Another great way to avoid fast fashion is to shop second hand. DISPOSABLE WATER BOTTLES- I love my reusable water bottle and never leave my house without it. Although the reusable bottle costs more than a single disposable plastic bottle, you only have to buy it once! A NEW OUTFIT FOR EVERY OCCASION- Another wedding, birthday, fancy dinner, event? I have no shame in wearing the same dress multiple times. It’s more sustainable, better for the environment [garments shouldn’t be thrown in a landfill after one wear], and better for my wallet. LEATHER BAGS AND SHOES- As a vegan and conscious consumer, I avoid buying leather. Finding cute, sustainable, non toxic/non plastic shoes and bags as a vegan is difficult, but it’s extra rewarding when you find brands that satisfy your aesthetic and values! I’ve saved so much money by buying fewer shoes. I recommend Nicora, Bhava, and Yatay for shoes and Filbert and Angela Roi for bags. When in doubt, shop second hand. A MORNING COFFEE- I used to stop at the coffee shop every morning to buy a coffee before starting my day. Now I either drink my coffee at home or bring it in a reusable to-go cup. I save money and can drink my fair trade and organic coffee [with the vegan creamer of my choice] wherever I go without single use disposable coffee cups. COMPANION ANIMALS- Adopt don’t shop! So many animals need loving homes. Although I’ve been adopting my whole life, I feel extra strong about this now. You can adopt the furry [hairy, scaly, feathered, etc] animal of your dreams for a fraction the cost—and they will be FURever grateful. ADMISSION TO ZOOS- Zoos, unlike animal sanctuaries, keep animals that would prefer to be in the wild in captivity. The majority of the time, in isolation and in conditions that aren’t ideal for their species and needs. Saying no to Zoos feels good and has introduced me to new ways to meet and interface with animals. Visiting and supporting animal sanctuaries is a much more satisfying way to spend my money! CONVENTIONAL MAKE UP- Buying green is better for bodies and the planet, and it has also drastically reduced the amount I spend on make up and skincare products. The majority of these products aren’t available at a local drug store, which means no impulse buys. For anyone who’s grabbed a new lipstick on a trip to buy toilet paper, you feel me. Taking time to research the products ensures that I'm only supporting companies that don't test on animals and are aligned with my values. Pro tip: opt for products that are package free or packaged in glass containers that you can wash and use again. NAPKINS- Reusable napkins are a great option that I’ve recently started using. Although disposable napkins were never my largest expense, it feels good to have an eco-friendly and reusable option [and now I’ll never need to buy napkins ever again]. PLASTIC BAGGIES- Replacing these little guys with reusable jars and reusable Stasher bags has reduced my need for single use disposable bags. Buying these monthly for all of your storage needs gets costly! I haven’t bought a food storage container in months after purchasing a few Stasher bags and repurposing all my glass tomato sauce, peanut butter, and other glass containers. K CUPS- I was an avid k cup coffee drinker, but after realizing how much plastic is thrown out for every cup of coffee, I decided to switch to a French press. I’ve saved money buying bulk coffee instead [those individual cups add up quickly in cost]! If you love your cup-using coffee maker, opt for a reusable, refillable k cup. PLASTIC TOOTH FLOSSERS- Those little individual plastic flossers make flossing so easy [although my dentist told me they aren’t the most effective]. They’re pretty expensive and create plastic waste. I’ve switched to Eco-dent which is vegan and packaged in paper that you can recycle as opposed to the common plastic floss containers. SINGLE USE PARTY DECORATIONS- Party hats and balloons feel really fun, but they end up in the trash really quickly. I use the same holiday decorations year after year. A really delicious vegan dessert is a much more beautiful centerpiece and makes a more delicious statement than tacky decorations that will only be used once. IMPULSE PURCHASES- They may seem small and inexpensive, but the cost racks up quickly and the items often end up in the bottom of a drawer/back of your closet/ or in the trash. I keep a wish list of things that pique my interest. If an item stays on my list for a while, I’ll start researching eco-friendly, ethically made, and sustainable options. This saves money and keeps my shopping mindful and intentional. Most things fall off my list in just a couple of days! ENERGY FOR DRYING CLOTHING- Clothing dryers are expensive and use a ton of energy. Drying your clothing also puts a lot of stress on the clothing and makes it age quickly. I line dry my clothing instead. It saves energy, which saves me money, and helps my clothing last longer.